Very few things light me up from the inside out like a call from the Nephew. Our conversation dances in short spurts of nonsensical words, a language imperceptible to most passersby. But we know. The giggling starts low and eventually bursts forth in glorious praise. And We. Can’t. Stop. Not long ago, his call carried a different tone. No giggles, plenty of tears. Happy ones. Tears that told a love story, long and deep and full of the goodness of God. His invitation touched my deepest places. This boy, given the name Caleb, seems to have been born a strong, old soul. With his Russian roots, he comes by his depth honestly. But the delight of his spirit? The spirit we share? It comes from Jesus. Caleb knows and loves Jesus because he’s immersed in His presence at home. That he recognizes this and expresses his understanding of it at nine years old, leaves me wide-eyed and wondering. How much do we understand the importance of immersion? For our kids? For our families? For our friends? For us? And do we recognize the relationships essential to provide a safe place for immersing ourselves in Jesus? We all need care and feeding, shelter and love. Always love. Without it, we wither and return to the earth. God designed us to receive His love through community. When we’re in community with life-giving friends, we help each other stay immersed in the presence of Jesus, each of us undergirding the other, nurturing, inspiring, equipping. It’s how we come to know Him, to love Him, to become like Him. Like Caleb, I’m grateful for my family—those related by physical DNA and the ones related by spiritual DNA. Some of you are part of that family. You help me stay in the presence of Jesus by loving me with His love, by caring for my heart, providing for me a safe place to be and to belong. If you’re reading this, and you don’t have family or community like Caleb and I do, will you please let me know so I can pray with you? Walk beside you? Help you to experience immersion in Jesus? Look at the delight on that boy’s face, excited to publicly claim Christ his Lord. 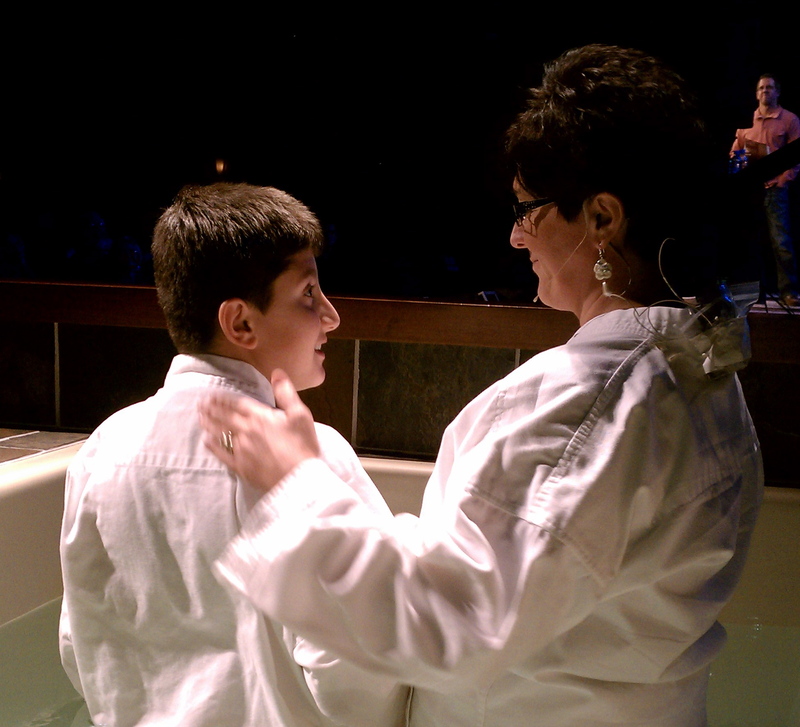 Consider the love of a mom who went against the norm to immerse her son in water baptism as an expression of her love and support. And what about the look of joy on the face of the pastor (and friend) who stays immersed in Jesus with his community so he can love and lead his flock at Southbrook Church? Wow Robin – this is so powerful! Your nephew is so wise beyond his years! Community is so important as I’m expereincing first hand right now with a change at our church. It’s leaving a deep void in me. But thank you for being an important part of my community by inspiring me and nurturing me thru your writing. Thanks for reminding me … it isn’t just a church family. It’s so much bigger, so much less contained. And always available. 🙂 Love your sweet relationship with that wonderful boy!! Jennie, you make me smile. Glad you’re a part of my community! Love you!